ATL Raise Up and Home Care Fight For 15: Will you do whatever it takes to help workers win $15 and hour and a union? UNITE HERE Local 23: Do you commit to fighting for a living wage for all workers at the Atlanta Airport? Also, Where do you stand on raising the minimum wage and what steps will they take if elected to make it happen? 9 to 5 Working Women Atlanta: Do you support policies like Ban the Box and other efforts to end employment discrimination against the formerly incarcerated? IATSE LOCAL 927: What will you do to address the misclassification of Georgian Workers? National Domestic Workers Alliance Atlanta Chapter: If elected, what do you plan to do to address the gap in health care left by our state not expanding Medicaid? To get more involved with Jobs With Justice you can sign up for our email list at our website: www.atlantajwj.org, join our monthly meetings every 4th Tuesday of the Month, (next one on October 28th 6 - 8 pm at the Georgia Hill Community Center 250 Georgia Ave Room 309 Atlanta, GA 30312) and finally, if you are a part of an organization reach out to our organizer Neil Sardana (neil@atlantajwj.org | 404-913-9595) if you are interested in having your organization, union, or church join our coalition. 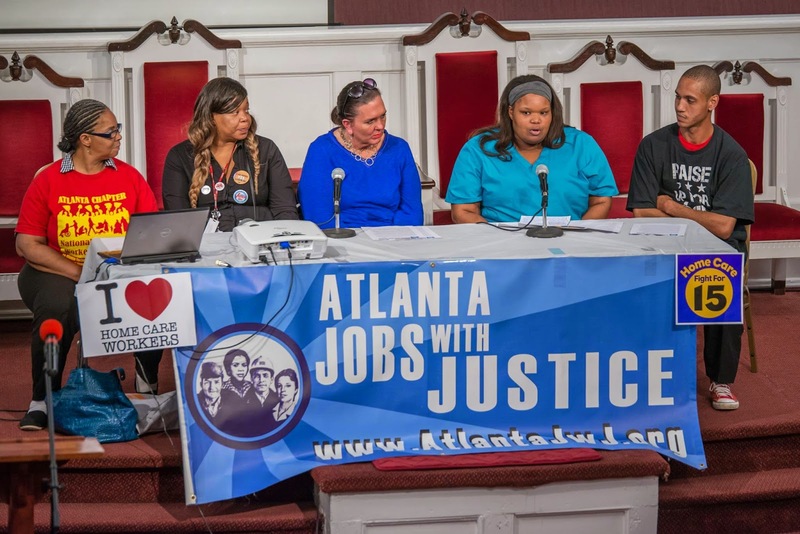 Atlanta Jobs with Justice kicked off its Low-Wage Workers Table by hosting the #WageExposed Worker Speakout and Election Forum on October 16th. To start the speakout we honored our great leader and one of the original founders of Atlanta Jobs with Justice, Reverend James Orange. Our Organizing Director, Neil Sardana read a statement from Atlanta Jobs with Justice detailing his legacy of organizing and building leadership within the Atlanta community and in particular in support in building the Atlanta Jobs with Justice coalition. 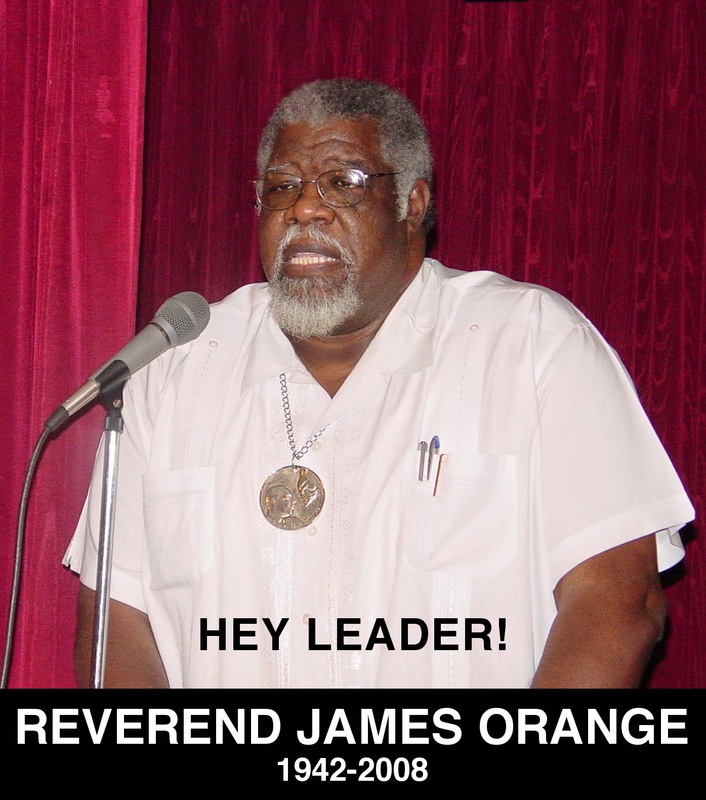 Reverend Orange's son Cleon Orange was in attendance to receive the dedication and tribute to his father on behalf of the Orange Family. Reverend Greg Fann from AFSCME Local 3 moderated the #WageExposed event and introduced the panel of workers struggling for higher wages and respect on their jobs. The worker panel consisted of 5 workers who shared their personal struggles and organizing efforts as members of worker organizations that are affiliates of the Atlanta JwJ Coalition. We had two candidates running for GA statewide elected offices in attendance listening to and hearing testimony from the workers: Robbin Shipp running for Georgia Labor Commissioner and Daniel Blackmon running for Georgia Public Service Commission. After the worker panel, we hosted an election forum for the candidates in attendance. They were each asked 6 questions by the workers on the panel representing the concerns and issues facing the organizations those workers represent. ATL Raise Up & Home Care Fight For 15: Will you do whatever it takes to help workers win $15 and hour and a union? Atlanta Jobs with Justice: Are you willing to push for the reversal of unemployment benefit cuts to Georgia's School Workers? In what ways would you be willing to support these workers who will in crisis when they no longer will receive their unemployment benefits? Low-Wage Economy Exposed: Atlanta Workers Speakout! In Atlanta, we workers will gather to speak out about the low-wages, the tough working conditions, and the lack of respect at our jobs, but also our dreams, our hopes, and our vision for a better future. We invite all with under paying jobs to join us. We will come together from different community groups, workplaces, and unions to fight together to change our economy and our communities. Low-wage jobs have become the norm in Atlanta and across our nation. As our economy rebuilds after the economic collapse in 2008 caused by the big banks, low-wage service sector jobs are the majority of jobs being created with more Americans relying on these jobs to make a living. Its getting harder and harder to get by working these jobs due to their low-wages, lack of benefits, poor job security, short hours, and irregular schedules. Every that goes by we workers in low-wage jobs are struggling to put food on the table, pay rent, afford transportation, and access healthcare. Our people are losing their homes, their cars, their health, and even in some extreme cases their lives, working on starvation wages. All while our corporate bosses of companies like Walmart, McDonalds, Gap, Target, Starbucks, and several others reap billions of dollars in profits and bonuses on the backs of we workers plus our families and our communities. Enough is enough, we are worth more and we demand more! Corporate America needs to be held accountable and we the workers are the only ones who can make them. Make them pay for the exploitation and inhuman treatment that has caused us much stress and suffering all for their limitless quest for greed and profit. We are standing up fighting for a fair economy with jobs with justice for all. We won't stop fighting until our rights are respected, we are treated with dignity, and we are paid a decent living wage. WE THE WORKERS WILL FIGHT AND WE WILL WIN! Last month, the National Labor Relations Board general counsel found McDonald’s Corp. to be a “joint-employer” alongside its franchisees. This legal decision could allow the corporation to be held responsible for the treatment and conditions of its franchisees’ workers and let workers unionize nationally across all stores. It is common sense that McDonald’s should be held responsible for treatment of its workers. This is a victory for the fast-food workers movement that is fighting for a decent wage of $15 an hour, fair working conditions and the right to organize unions. McDonald’s continues to challenge the notion it is responsible for its workers and plans to appeal the NLRB decision. However, McDonald’s and other fast-food franchisers understand the franchise model is designed to create a false barrier between the corporate entity and its workers. This allows the corporation to pay minimal wages while shifting the blame and responsibility for workers to franchisees. Franchisers including McDonald’s have invested billions of dollars to build brands, structure franchise models, promote and sell products and establish customers across the world. Given this, it would be ridiculous to believe corporations do not have direct control, or at least compelling influence, over the structure and operations of its franchisees. This control is needed by the corporation to protect and maintain a consistent brand and sell the same Big Mac coast to coast. This franchise model is a “godfatheresque” management style, where the corporations have all the money and power but utilize those lower on the chain (the franchise owners) to do the dirty work of keeping workers underpaid and under control. The recent NLRB finding challenges this structure. It places accountability where it belongs, right at the top. Workers should be able to negotiate with, and hold accountable, corporations that are the ultimate beneficiaries of their labor. In this case, they are responsible for pay inequity at rates over 1,000 to 1 of compensation for CEOs vs. fast-food workers. The franchise model hurts workers because it allows corporations to squeeze them dry while denying any responsibility. However, it also puts small franchise owners at a disadvantage and leaves them with little control over their own stores and livelihoods. Franchisees are squeezed out of their profits to pay rent, advertising and marketing costs and other mandatory franchise fees to the corporation. Some franchise owners have spoken out against the bottom-barrel wages and absolute control McDonald’s exerts over its franchisees. Kathryn Slater-Carter, owner of a McDonald’s franchise in Daly City, Calif., challenged the inability to offer health insurance and the low wages she was pressured by McDonald’s to pay. She worked with the California Legislature to pass a bill enabling greater rights of independent franchise owners, allowing them to control certain elements in their businesses without fear of corporate headquarters threatening to suspend their franchise. In the “Fight For $15,” we are absolutely clear that fast-food corporations are determining how their franchisees operate. The corporations are responsible for the extremely low wages and the utilization of public welfare benefits to subsidize their work forces. This is why, from the outset, corporations and not franchisees have been the clear target for fast-food workers’ demands of $15 an hour and the right to form a union. We celebrate this decision by the NLRB as a step in the right direction. The struggle for fair wages and respect for fast-food workers and all underpaid workers moves forward. Join us at 11:30 a.m. Thursday at 660 Boulevard NE, Atlanta, for the next ATL #FightFor15 worker rally. ATL to #StrikeFastFood on Thur Sept 4 @ 11:30 AM! Fast food workers in the ATL & nationwide are going ON STRIKE Thursday, September 4. Workers across the country are standing up this week and saying: We deserve more. Our bosses pay us poverty pages, while we work hard everyday to make them millions. It’s not right. If you’re with us, spread the message by sharing this image on Facebook and Twitter right now. We know that we have momentum on our side. We know that people like you have our backs. And over the summer, we committed to do WHATEVER IT TAKES to get $15 an hour and the right to form a union without retaliation. Fast food workers across the country are starting to experience what it feels like to fight for better pay and better treatment – and it’s amazing to see. We all hope that you’ll be standing right there with us on Thursday. Show us – show the world – that you’re with us by sharing our strike announcement over Email, Facebook, or Twitter right now. MAY 15 GLOBAL STRIKE to RAI$E UP: ATL Low Wage Workers & Moral Monday UNITE! & FAST FOOD STRIKES GO GLOBAL! Join Moral Monday GA & Atlanta Jobs with Justice to stand with low-wage workers in ATL + 33 nations worldwide for a GLOBAL STRIKE for $15/hr & a Union! On May 15th, fast food workers everywhere, not just the U.S. but on every continent where McDonald's operates will be standing up for $15 an hour and the right to form a union without intimidation. Yeah. Global. Everywhere. Are you with us? We know that profitable fast-food companies can afford to give workers a decent wage, avoid stealing from employees' paychecks, and respect our right to form a union. And with workers worldwide adding their voices, nothing can stop us. It's time for the fast-food giants to treat the people who make and serve their food with the same respect everywhere. Spread the word and join the worldwide movement for fair wages and respect. Preview of May 15: STRIKE TO RAI$E UP! Moral Monday & Low-Wage Workers UNITE! See a short preview of the MAY 15: STRIKE to Rai$e Up! Moral Monday & Low Wage Workers UNITE! : McDonalds Employee Connie speaks out against billion dollar fast food companies paying starvation wages at Moral Monday GA Rally for Workers' Rights and Economic Justice. As of last night, at the stroke of midnight, the clock of human progress turned back decades. You have caused unfair, unjust and harmful consequences for regular everyday Georgians with the passage of HB 990, HB 772, HB 714 and SB 98. Sadly, your inaction has and will continue to cost real lives and hardships for Georgians who are already struggling. You have chosen politics over principle, a short term view of narrow self-interest over a long term vision of what's actually best for Georgia, making public policy turns that further marginalize our most vulnerable citizens while also crippling the state's prospects for economic recovery and prosperity. Your lack of regard and compassion for the 650,000 hard working Georgians who would benefit from Medicaid expansion is very troubling. You have signed death warrants for thousands who will die needlessly every year without it. Out of your office we continued to hear the same justification for not accepting Medicaid expansion; Georgia couldn't afford it. While repeating a lie over and over again might work in your political universe it doesn't make it less of a lie. Medicaid expansion would turn the 650,000 hard working Georgians that are forced to go to the emergency center as their only means to healthcare into paying customers with access to preventative care. It would bring over 45 billion dollars of revenue and over 70,000 good paying jobs to our state. As it turns out, doing what's morally right is also economically smart. When we and future generations look back in history, we will see a Governor who failed to understand this. That is why he restricted affordable healthcare and expanded gun rights, publicly celebrating the most dangerous and irresponsible gun bill to be passed in the country. We will see a Governor who allowed and supported attacks on the rights of women by further limited access to reproductive choice. A governor, who condoned removing unemployment benefits to the same bus drivers that protected our children during an unnecessary snow crisis. We will see a Governor that supported drug testing of food stamp recipients and continues to place roadblocks against the Affordable Care Act. You have continually shown your support for the few rich at the cost of the overwhelming poor and working class Georgians by capping income taxes, and restricting loans and scholarships for our state's students. Georgia deserves better than this Governor Deal. When we look at the past legislative session through a moral lens we see our state's priorities with deep concern. We see a Governor more concerned with party agendas than the welfare and progress of the people he represents. Although this is of deep concern to us, we are hopeful that moral responsibility will be reflected in the future legislation of Georgia, and we are willing to organize toward that end. In the words of Dr. Martin Luther King, " We must accept finite disappointment, but never lose infinite hope." Georgia State Bus Drivers are Under Attack! Your action is needed. Right now, students in Atlanta are working to build a group to support bus drivers at Georgia State who are majority women of color and are under attack by MV Transportation, a private company on campus. In spring 2013, MV Transportation was awarded the contract to provide student bus transportation on campus. The company immediately laid off 25 union bus drivers who were represented by Teamsters Local 728 and employed by First Transit, and reduced their starting wage overnight from $11.50/hour to $10.00/hour. Will you sign our letter to Georgia State President Becker and tell him to demand that MV Transportation pay a living wage to GSU bus drivers? On October 14, MV agreed to recognize Teamsters Local 728 to represent the current Georgia State drivers after 90% of the drivers signed cards declaring their support to unionize. Teamsters Local 728 is currently in collective bargaining negotiations regarding Georgia State's bus drivers' wages with MV. In an outrageous move, the company wants bus drivers to make less than an hourly living wage. In the coming weeks, President Mark Becker of Georgia State University will be given a demand letter to immediately establish a base living wage for all current and future contracted bus drivers and to tell MV to pay a living wage to Georgia State bus drivers. Contracting services at Georgia State and across the country are broken. MV Transportation says that they received the bid to provide bus transportation because they significantly underbid the unionized contractor by offering savings through reduced labor costs. Such trends in contract services at colleges and universities act to drive down standards for contracted campus workers — especially those that have fought hard over years to organize a union and bargain to raise their standards. Will you stand with students and workers in Atlanta and send a message to President Becker? P.S. 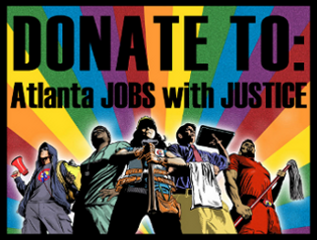 After you send your message to President Becker, become a sustaining member of Atlanta Jobs with Justice. A small monthly contribution supports actions like these and keeps our local organization fighting and growing. We can Still Stop the Unemployment Cuts to School Workers in the Senate! Yesterday The GA House passed the Unemployment Cuts bill HB714 largely along party lines. Passing it 111 to 60. The bill will now move to the GA Senate where we have a chance of stopping this attack on school workers, many of which who took care of our children during the infamous snowjam that left thousands stranded on the frozen streets. HB 714 bill would make the previously overturned unemployment benefit cuts imposed by GA Labor Commissioner Mark Butler permanent in state​ law and expand these cuts to most contract and seasonal employees across GA.
Tell your Senators to stop this attack on low-income workers and the unemployed and that they should be thanking these workers for being heroes to our children and focusing on improving jobs or creating new good jobs in Georgia. Please Take Action to Contact Your Senators Today! GA House Votes to Punish School Workers because their Bosses are "Gaming the System"
Six Congressional speakers took the floor of the Georgia House of Representatives Monday morning and agreed, one after another, that a handful of private contractors have been exploiting Georgia's unemployment benefit system. Where public schools typically pay their bus drivers and cafeteria workers year-round, several private contractors have cyclically hired these employees to inexpensive nine month contracts, relying on the state of Georgia to kick in unemployment benefits during the summer. And yet, at the end of nearly an hour of debate, the House voted 111-60 to revoke unemployment benefits for these workers, effectively punishing employees for the misconduct of their employers. If the bill – HB714 – passes the Georgia Senate later this week, thousands of Georgia workers will lose their summer income. 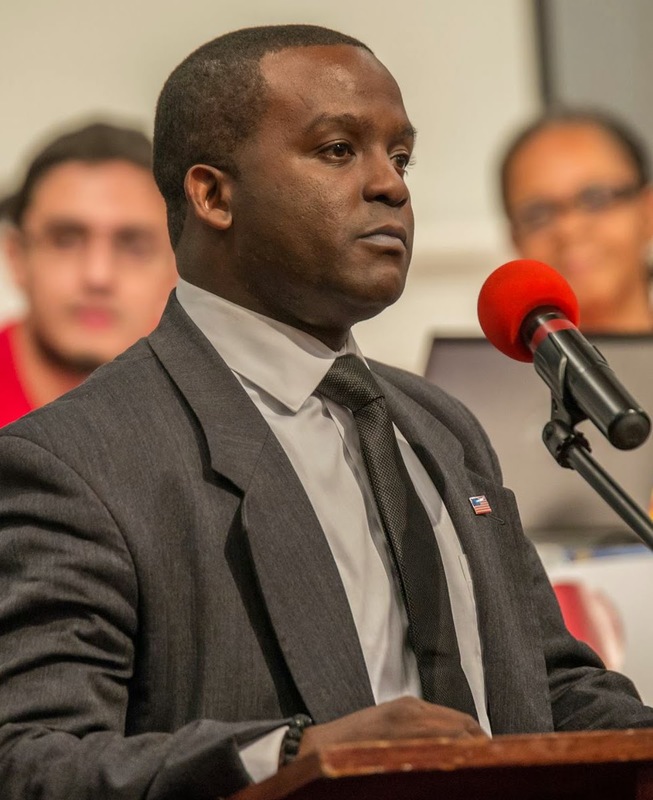 Affected workers have spoken out against HB714: Deon Brooks, a bus driver with an Atlanta charter school, recently explained to a CBS Atlanta reporter that "in just three months no one wants to hire you if you're leaving again... Without those checks, some of us literally become homeless.” This reality – that temporary, three-month employment is not easily available in a state with a 7.4% unemployment rate – was lost on Rep. Mark Hamilton, the bill's sponsor and one of only two state representatives to speak in favor of the bill during Monday's extended debate. 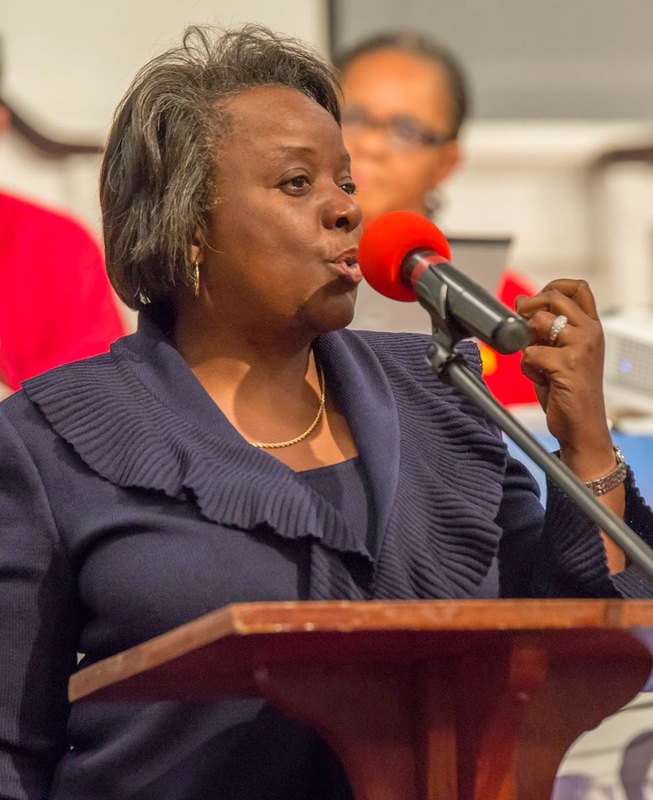 Rep. Hamilton's claim that unemployed school workers can simply find other work during the summer betrays a profound disconnect with the people most affected by his legislation. Other representatives spoke out persuasively against the bill during Monday's legislative session. Rep. Al Williams drew applause with a powerful speech, expressing his “terror at the lack of compassion” in the bill and “praying for the day when [Georgia] is the best place to live and the best place to work,” and not merely, as some have claimed, the “best place to do business.” Rep. Pedro Marin added that eliminating benefits for contracted school workers, most of whom earn $13,000-$18,000 a year, would be a slap in the face to the same Georgia bus drivers who just two weeks ago worked through the night to ensure the safety of Georgia's children in a paralyzing snowstorm. And Rep. Stacy Abrams, the House minority leader, persuasively made the case that HB714 was little more than burden shifting: from the unemployment system to the welfare system, from businesses to employees, and from private companies to public schools. For supporters, the case for HB714 essentially comes down to the claim that there are no alternatives. Rep. Jimmy Pruett, the other representative to speak in favor of the legislation, claimed that after a summer of investigation into the unemployment issue he could find “no alternative” and that, if such an alternative existed, he would support it. But this claim makes little sense. For one, Congressional representatives suggested several alternative measures, from a Department of Labor decision to increase private contractors' contribution to unemployment benefits, to a reclassification of seasonal workers under unemployment law, to the establishment of a committee to further study the issue. For another, the representatives pushing the bill have showed little willingness to listen to outside input that could lead to alternative policies, refusing to listen to worker testimony at Thursday's committee hearing and limiting Monday's debate to under an hour before calling for a vote. And even if there were no other way to punish companies for exploiting unemployment law, this still wouldn't justify legislation that holds workers accountable for their employers' misconduct: if this is the best policy that can be found, then it would be better to do nothing at all. HB714 passed the Georgia House on Monday, but it can still be stopped in the Senate. Make sure your Senator knows the facts: to make your voice heard on unemployment benefits for Georgia workers, contact your district's Senator, or call Lt. Governor Casey Cagle at 404-656-5030. 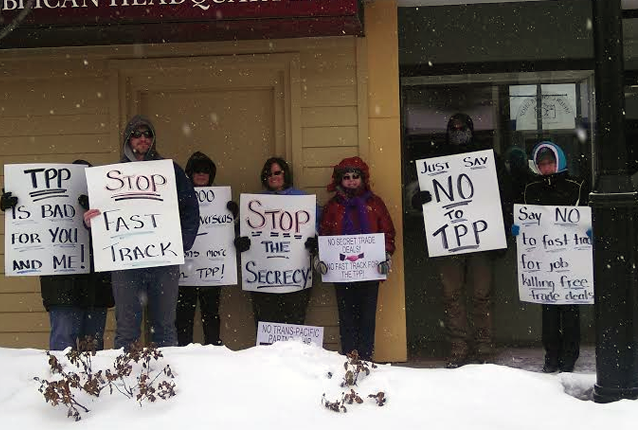 Say NO to Fast Track! Given that we’re used to a slow moving Congress, it’s understandable that “Fast Track” legislation sounds promising. Unfortunately, Congress will soon consider “Fast Track,” which would limit debate and prevent amendments in Congress on trade deals. Such expedited authority would make it much easier to pass future trade agreements, including the proposed anti-worker Trans-Pacific Partnership agreement. Jobs With Justice opposes “Fast Track” because it is a license to continue trade policies written by the 1% for the 1% without an ability to hold our country’s negotiators accountable for provisions that hurt working families. Trade agreements like the Trans-Pacific Partnership, drafted by special interests in the backrooms of power, should be subject to vigorous democratic debate. “Fast Track” limits Congress’ ability to oppose specific provisions within trade agreements that would never pass on their own. We know from the record of failed trade deals like NAFTA that these provisions have a devastating impact on workers and their communities. Americans deserve a fair process that gives Congress the opportunity to influence trade deals and to send bad trade deals back to the negotiating table for improvement. If you agree, join with Jobs With Justice and groups across the country who are calling on Congress this week to say NO to fast track. Extreme politicians in Georgia are at it again. Attacking those in our state who have the least! Last year, these legislators pushed a bill to try and deny unemployment to tens of thousands of bus drivers, food service workers, private school teachers, and all other contracted school workers, but we stopped them from passing it due to a huge public outcry from families and communities across our state. Now, they are back with HB 714, the same bill from last year, that eliminates unemployment benefits for hard working families. The House Industry and Labor Committee is considering this measure. If we can stop it in committee, we can make sure it doesn’t see the light of day. Send an email to members of the Georgia House Rules Committee now and tell them to oppose efforts to deny unemployment for tens of thousands of school workers. Call GA House members TODAY and express your opposition to this mean spirited and anti-worker bill. These cuts originally imposed by Mark Butler, put workers in a dire situation. When cuts were previously enacted, workers struggled to put food on the table to feed their families, many were not able to afford medical care, and most struggled to pay their rent or mortgages putting them at risk for eviction. We stopped this situation from continuing last year, but we must all come together to stop it again in the legislature. Please lend your voice to these struggling workers and tell our politicians that enough is enough! We will not stand for anymore attacks on those who struggle the most and have to live paycheck to paycheck making the hardest of decisions to survive. Unemployment benefits are a safety that these workers rely upon while they’re laid off during the school breaks. Unlike public school teachers, who are on a 12 month contract, these workers are only paid on a 9 month schedule and laid off for winter and summer breaks. This bill will make working for contracted school companies unsustainable and cause great deal of employee turnover. Instead of veteran school bus drivers driving our children to school, companies will have to hire and re-train novice drivers, putting our children at risk, and increasing costs for the companies that will inevitably by passed on to taxpayers. It’s a bad situation for everyone. Let’s not allow it to happen. Send an email to members of the Georgia House Rules Committee now and tell them to kill this bill! The Beloved Community. January 26th. Join Atlanta Jobs with Justice as a part of Moral Monday GA at the Georgia State Capitol for our first rally, 4-6 pm on January 13, 2014. Medicaid expansion has the potential to provide access to health insurance to 650,000 of our most low-income Georgians, prevent over 3,600 deaths each year and create nearly 70,000 more jobs for the state of Georgia. Join us at the rally and help us demand that Governor Deal expand Medicaid NOW! Guest speakers include spokespeople from our Georgia community, labor and faith-based organizations. Moral Monday Georgia is a statewide coalition of concerned community groups and individuals working for policies and legislation that work for all the people of Georgia. We are building the collective voice of the people to be heard over the voices of big money and repressive government. Learn more at www.moralmondayga.org. 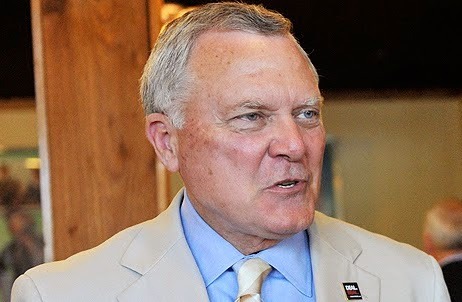 Governor Deal EXPAND MEDICAID NOW!